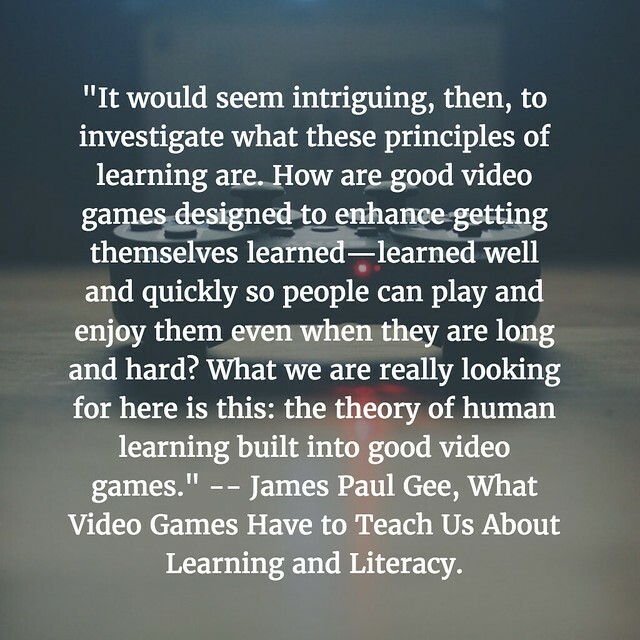 I’m off on a new reading adventure, diving into James Paul Gee’s book — What Video Games Have to Teach Us about Learning and Literacy — with discussion prompts by my friend, Keegan (who once led me into Minecraft with Networked Narratives). This is our first week of responses, and we read the first two chapters. 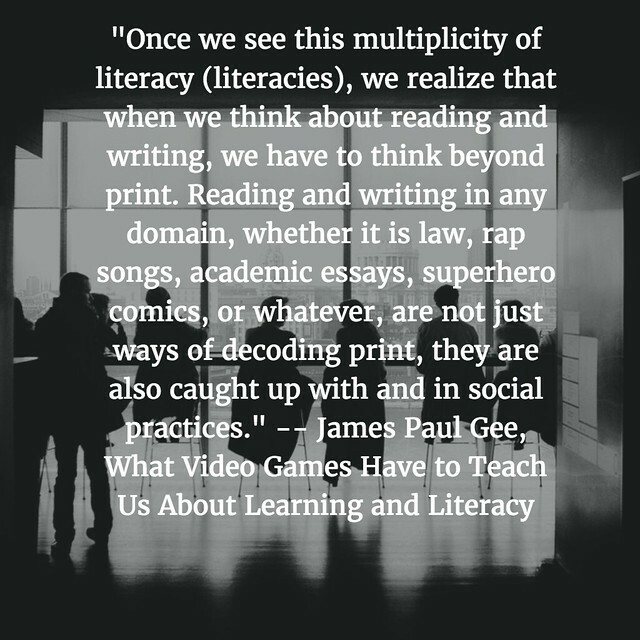 Gee’s work has had a lot of influence on thinking about literacy and video games, so I have seen some of his video presentations and read smaller pieces, but never the book itself. It’s a bit dated now (2003, and updated 2007) but it seems so far that Gee’s ideas and insights still stand up. Gee’s defining of terms such as affinity spaces (a favorite of mine in relation to CLMOOC), Semiotic Domains (a new one for me), and literacies and learning already has me thinking of my teaching and my own learning. I appreciated that he approached the topic from the standpoint of a father wondering what his son was doing when playing video games, and then as he immersed himself (perhaps more so than most of us would do), he began to uncover the variety of skills and literacies needed to play these games but also the invisible literacies in the design itself (which is where I am most interested). I am curious/confused about this Semiotic Domain concept, and how people immersed in a system of some sort share commonalities of learning and more. What is this concept? Well, “Semiotic domains as described by Gee (2003) refers to a variety of forms that take on meaning such as images and symbols, sounds, gestures and objects.” It also refers to “… distinct collective consciousness shared by people with similar interests, attributes or skill sets …” — from http://etec.ctlt.ubc.ca/510wiki/Semiotic_Domains You can tell there’s a lot to unpack there. The elements of multimedia composition coming together into the video game medium/format is undeniable, and finding ways to showcase those elements seems important, particularly as I work with my students in a few weeks on our own video game design project. I’ve been reading the book on the Kindle and then using my highlights and notes for sharing of some quotes. This kind of curation works most effectively for me in my busy life for finding and keeping some anchor points. 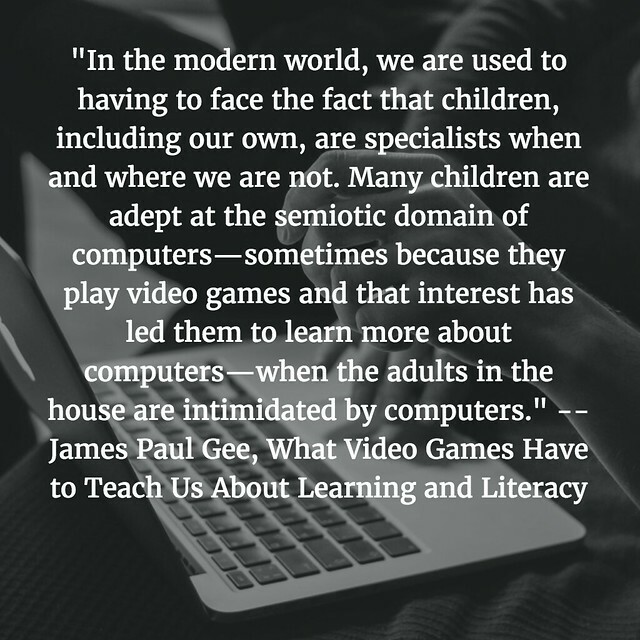 This third quote nearly goes in the direction of immigrant/native, which would have turned me off (even remembering the 2003 publication date), but Gee straddles the line and makes it more about adults needing to pay more attention to what kids are doing. Come join the conversation. Keegan has an open invitation. Let’s learn together. Thanks for sharing this Kevin. It’s always fun to see what content resonates with folks, especially when studying topics in tandem.